This pro advice will help you create concepts quickly and master the art of speed painting. Speed painting is exactly what you'd imagine – creating art against the clock. Artists give themselves a limited time to finish a piece of work, from a few minutes to a couple of hours. It is a great way for beginners to learn how to paint and for more experienced artists to hone their painting techniques. It's also a load of fun. Unlike sketching, however, speed paintings are considered complete after the time is up – if you alter your work afterwards, it is no longer a speed painting. To help you become a speed painting master, artists who contributed to 3dtotal Publishing's Master the Art of Speed Painting have shared 10 top speed painting tips from the book. On your marks, get set, go! Alex Olmedo says: "Custom shapes are super useful tools for artists and are often forgotten by a large majority. They are simple, fast, and fun to make, and are great time savers when designing and speed painting. On those days when you feel uninspired to make art, you can make these instead. "Simply scribble abstract shapes using a hard brush, then play with them; try copying, repeating, overlapping, and transforming the shapes and using them in your art." Katy Grierson says "Use a big Brush tool to lay down some strokes of varying colour, tone, texture, and opacity. Try not to paint anything specific, just fill the canvas with colour and texture. You can switch brushes but try to keep the size quite large – this is good for speed and preventing the urge to paint something specific. "This initial letting go can be the hardest thing to master but the effects are worth it in the end. By starting this way there is less pressure to fill a blank white canvas, which can be a hindrance to creativity." Donglu Yu says: "Before I start working on a speed-painting session I like to warm up with some custom brushes. Depending on the theme, try to limit your selection of brushes for the speed-painting process. Working with a limited range of brushes can force you to work more efficiently by thinking about shapes and design rather than brushstrokes. This may take a while to get used to but it will speed up your whole process." Massimo Porcella says: "Once you have set the tonal values of your image you need to add a base colour. The Gradient tool is perfect here because you can choose the colour for every part of the sketch, starting from the ground, at the base of the buildings, moving to the skyline shade, and finally picking up a colour to define the shade between land and sky. For an even colour palette, use the Eraser tool to blend all the colours together." James Paick says: "I can't stress enough the importance of having a good photo reference library. You can find plenty on the internet but nothing beats going out there and taking your own. You can get the right exposure, scenery, and contrast to work with your current piece, or just interesting landmarks or cloud formations which might spark a new idea and build the imagination. "Don't limit yourself to the natural world; there are so many fascinating and elaborate architectural elements on buildings and other human-made things." Jesper Friis says: "In a fit of boredom one day I decided I would drag out my old scanner I had sitting around and started painting on the glass with some watercolour. I closed the lid to see what would come out. Since then I have been making weird textures this way from time to time. "It might seem a little silly at first, but even a day spent experimenting with some of these methods for making textures can give you something in your library that you will keep coming back to, something that's uniquely yours and really can't be recreated." Stephanie Cost says: "To add complexity to your painting you should make full use of textures and custom brushes – there are hundreds of free ones on the internet. Find yourself a nice variety such as a rounded lizard skin-esque one, a smooth chalk-like one, or maybe a chunky, rough gravel brush. They are great for breaking up the internal shapes of your composition. You can try using a soft flat brush with Hue Jitter on each stroke; this is good for harder edges and unexpected colours." Check out the 60 best free Photoshop brushes, the 30 best Procreate brushes and how to create your own custom brushes in Clip Studio Paint. Olmedo says: "When making photobashing images it is very important to choose the right photos. Often if you try to include a photo with a totally different lighting source compared to others involved in the image you'll end up spending too much time trying to fix the problem and even dismissing the photo." Ian Jun Wei Chiew says: "The Transform, Clipping, and Smudge tools are essential to my workflow as I prefer to create a collage and find shapes, rather than painting right from the get go. I find this method to be more fun and experimental, which can lead to ideas and compositions you would never think of developing. "There are endless possibilities with Photoshop; you can find a new use for any existing tool. At the end of the day, what makes a good image is your own personal knowledge of the foundations such as composition, values, colour, and lighting." Yu says: "My students often like to tell a very complex story with one image. My feedback is always that you should pick the top two or three things you want to tell through the image, and tell them really well. "When a story is too complex, you need to divide your canvas space into smaller portions to distribute it all to the different storytelling elements, making it difficult to come up with an iconic composition." 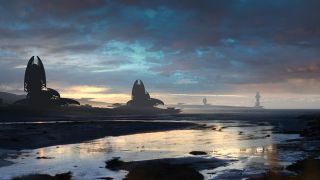 These tips come from the book Master the Art of Speed Painting from 3dtotal Publishing, aimed at aspiring digital painters and concept artists.